The Printronix P8010 Tabletop Printer prints up to 1000 lines per minute. With the new P8010 Tabletop line printer, you gain maximum uptime, lower total cost of ownership and reduced noise in the smallest footprint available. The Printronix P8010 Tabletop printer is the answer when you need to optimize space and seek portability to expand to other locations easily. For industrial label printing in a small footprint and enhanced value, Printronix’s P8010 Tabletop printer offers the newest features to fit within your office or supply chain. Because it’s quiet, smaller and more flexible, Printronix tabletop printer is the right choice for a wide variety of applications. This line matrix printer model covers any type of application, from light industrial volume needs to rugged, round-the-clock printing performance. 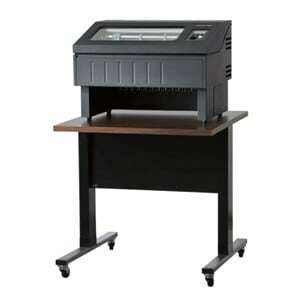 The P8010 tabletop line printer printer is durable and reliable. It’s the go-to solution when you demand location flexibility, programmability and advanced networking connectivity in a compact size. Simplified deployment and support, especially in networked environments. Compact footprint for space constrained applications. Coming soon: Quick-access capability will lend flexibility so you can scale printing to match transactional usage. Adaptable Functionality. The Printronix P8010 tabletop printer adapts to almost any supply-chain or back-office environment. More models to fit your unique requirements including the enclosed pedestal, quiet cabinet and new tabletop model. PowerPrint™ delivers improved print clarity and print darkness on multi-part forms by increasing impact energy. PowerPrint is a standard feature on Printronix P8010 line printers with a 1,000 line-per- minute print speed. Manageable Savings. The Printronix P8010 tabletop line printer is a smart purchase. New energy efficiency technology lowers idle power consumption and boosts operating efficiency.